The Giraffe is a great, little more conspicuous constellation in a darker area of the northern star sky. Cepheus, Cassiopeia, Perseus are its neighbors as well as the Great Bear, Little Bear and the Dragon. The "Giraffe" is a "modern constellation" which was first introduced in 1612 by Petrus Plancius, a Dutchman. He added it as a so-called filling pattern. The Giraffe fits discreetly between the more prominent constellations "Big Bear", "Cassiopeia" and "Herdsman". This constellation holds a few interesting objects of observation about nearby galaxies and also yellow and blue supergiants. For example Alpha Camelopardalis, a supergiant thousands of light years away. 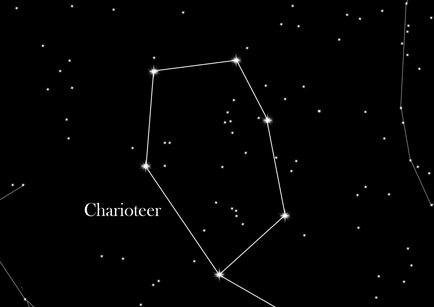 This constellation has no mythological background because it is one of the modern constellations. The stars of the giraffe were associated with antiquity. Not until 1612 did Petrus Plancius call this constellation a "filling pattern", and thereby it got its name "Giraffe" which was the modern name of "Camelopardalis".